Something very strange is happening in political discourse in Scotland – everyone’s talking about tax. The Scotland Bill hasn’t even been passed, but it is having the desired effect of moving the debate from spending, to a debate that includes how we will raise the necessary resources. This is a debate that goes to the heart of the sort of Scotland we want to live in. Yesterday was a busy day for the taxation debate. I started the day at the IFS seminar on the recently agreed fiscal framework. The three David’s, Bell, Eiser and Phillips (is it only David’s who do numbers? ), took us through the different models for adjusting the block grant the Scottish Government receives from the UK Government to reflect the new devolved tax and welfare powers. Adjusting it in the first year is straightforward; the tricky bit is indexing future years. The UK government favours the Comparable Model (CM) which recognises that Scottish revenues per capita are lower than rUK, but the Scottish Government objected because it does not account for Scotland’s slower population growth, which is likely to be half that of rUK. The Scottish Government therefore favours the Indexed Per Capita (IPC) approach which increases in line with comparable UK spending and the rate of population growth in Scotland. The compromise reached is that the Comparable Model will be used, adjusted to achieve the outcome delivered by the IPC approach. This holds until a review in 2021-22. The IFS argument is that while this meets the Smith Commission’s ‘no detriment’ principle, it fails the ‘taxpayer fairness’ principle. While I accept the numbers, I beg to disagree on their interpretation. As a trade union official, I think I understand very clearly what ‘no detriment’ means in an agreement. On the other hand, ‘taxpayer fairness’ is less clear. I would also argue that this is fair because Scotland does not have all the economic levers of central government. A point developed in Jim Cuthbert’s Reid Foundation paper. The fiscal framework does leave some risks for the Scottish Government. The agreement only insulates Scotland from UK wide shocks, not those that affect Scotland to a greater extent than rUK. In addition, the Scottish Government got fewer borrowing powers than it hoped, both for resource and capital borrowing - some way short of a prudential regime. Next up, we had the First Minister announcing the SNP plans for using the new tax powers. She said that no taxpayer will face a tax increase. However, they will reject the UK government's plan to cut the tax for middle earners by only increasing the 40p threshold by the CPI inflation rate, taking it from £43,000 to £43,387. They will slightly increase the basic personal allowance from the planned £12,500 to £12,750, avoiding this reserved power by the mechanism of a zero rate. The FM said: "That increase will prevent higher rate taxpayers from receiving a real terms cut in their tax bills, but nor will they see their bills increase”. In addition, the SNP is now not proposing to increase the additional rate, for those earning £150,000 or more, from its current 45p level. While not passing on Osborne’s 40p threshold tax cut is welcome, the rest of the package does nothing to tackle austerity, respond to the huge social challenges facing Scotland or make tax more progressive. Changes in tax allowances benefit all taxpayers. As 83% of Scottish taxpayers pay the basic rate, we simply have to get real if we are to meet current needs, let alone address civil society’s shopping list. Labour and the Liberal Democrats have started to recognise that. 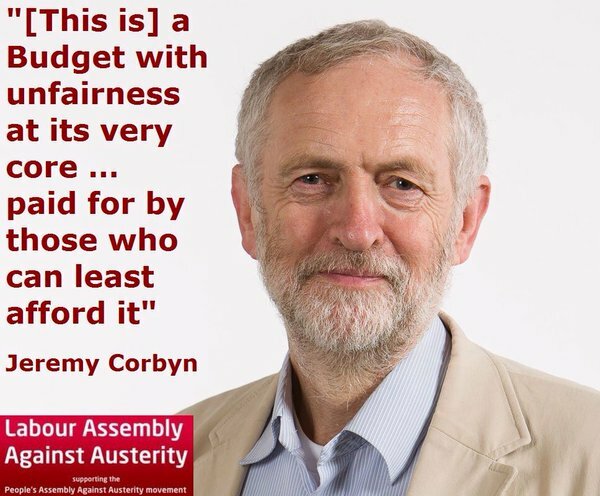 Others must follow if they are serious about tackling inequality and providing decent public services. And finally, Scottish Labour announced that it wanted to scrap the Council Tax and replace it with a tax based on property values. Councils would also get discretionary powers to introduce new taxes including a Tourist tax and a Land Value Tax on vacant, economically inactive land. They would also devolve the surplus from the Crown Estate to local government. In essence, this is similar to the plan recommended by the Burt Commission and closely matches UNISON’s policy position. Property values are easily understood and assessed, and provide a more progressive and certain local tax. We are always happy when political parties adopt our policies! Labour has capped the increase at £3000 making it less progressive at the very top. I understand the desire to avoid £5000+ increases, but in the longer term the cap should be phased out. Equally, restricting increases to 3% is fine as a transitional measure, but once the new system has bedded in that should go. Otherwise it means councils have less control over setting the rate. Local democracy is the only proper constraint on a local tax. After years of inaction we have local taxation proposals coming from all directions. Scottish Labour’s plan is a proper reform of local taxation, even with a bit of political expediency mixed in. Whatever you think of the various proposals, we are at least starting to have a debate about tax in Scotland. It isn’t always comfortable, but perhaps that’s the point. Today is World Water Day. The 22nd March is designated as World Water Day by the UN to mark the importance of water and sanitation. This year's theme is 'Better Water, Better Jobs'. 1.5 billion people work in water related sectors and nearly all jobs depend on water and those that ensure its safe delivery. Yet the millions of people who work in water are often not recognised or protected by basic labour rights. The theme in 2016 is therefore focusing on how enough quantity and quality of water can change workers' lives and livelihoods - and even transform societies and economies. In Scotland we benefit from a public water service, unlike the rest of the U.K. Recognised trade unions ensure that basic labour rights are protected and we have a high quality water and wastewater provision, delivered at a reasonable cost. However, we should not be complacent. The privatisers have been chipping away at Scottish Water for years. Many of our wastewater plants were updated using the ruinously expensive Private Finance Initiative (PFI). Those plants are still managed by private water companies and even the Water Industry Commission has suggested buying them out. Contractors have been taking over large chunks of Scottish Water. 92% of the capital programme is delivered by private contractors. This year the Scottish Government awarded a £350m contract to Anglian Water to provide water and wastewater to the Scottish public sector. Anglian is one of a number of English water companies who are happy to take public contracts, but less enthusiastic about paying Corporation Tax. Finally, on the horizon we have the trade agreements, CETA and TTIP. Both of these put public provision at risk, by allowing corporations to challenge democratic decisions to return services to public ownership. For example, Anglian Water is part owned by Canadian pension funds. The EPSU was going to press their enormously successful European Citizens Initiative 'Right2Water' today. It calls on EU institutions and Member States to ensure that all citizens enjoy this right, that water supply and management be excluded from “internal market rules” and commercialisation, and that the EU increase its efforts to achieve universal access to water and sanitation. 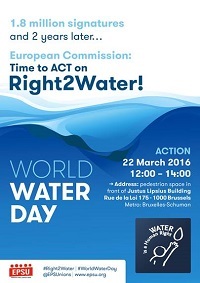 Despite huge support for the Right2Water movement, the European Commission has failed to act. An unambitious Communication released by the Commission in 2014 has been followed by two years of silence and no concrete legislation. The tragic events in Brussels meant today's event was called off, but the campaign goes on. World Water Day is an opportunity for us to remember that the clean water and sanitation we take for granted is not available world wide. We should celebrate our public provision, but remain vigilant. The privatisation sharks have not gone away. Yesterday’s budget was originally going to be a big day for pensions with announcements on the review of pension taxation. However, this was scrapped or deferred, as the political consequences for Brexit put it in the 'too difficult' file for now. In general, there will be a sigh of relief for most of the sector, as Osborne would probably have made the wrong decisions. Even though there are sensible reforms that UNISON and others suggested to the review. This doesn’t mean there was nothing of interest on pensions. 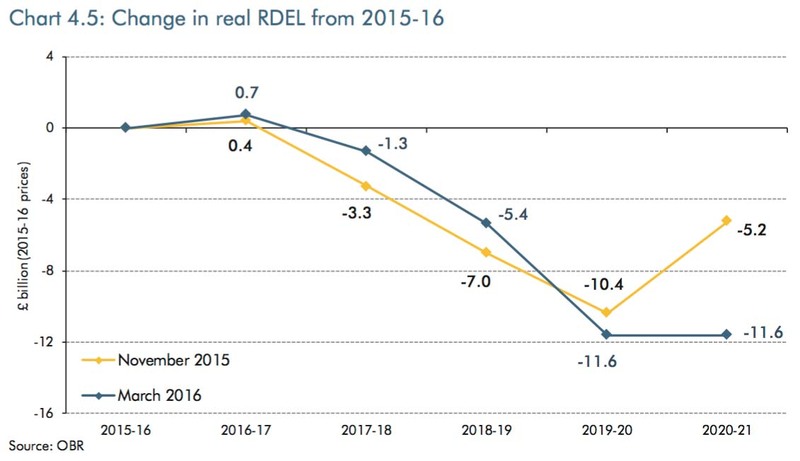 Early in the Chancellor’s speech he mentioned a change in the Discount Rate. I choked on my soup, but most people would be thinking ‘what’s that?’ The Discount Rate is the assumed investment return used in a present value calculation of assets and is probably the most important factor in pension cost calculations. 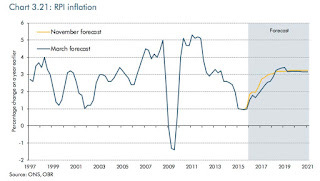 The current net Discount Rate above inflation (CPI) is 3% and he reduced it to 2.8% with effect from 2019-20. This announcement wasn’t expected because there has been no consultation with stakeholders or an explanation as to why it is being reduced. This means the employers in pay-as-you-go public service schemes (primarily NHS Scotland health boards for UNISON) will have to find another £2 billion pounds from 2019. Health board finance directors will be busy calculating their share of that cost. It doesn’t do anything for pensions; it’s just another Treasury raid on public services. In a funded scheme such as the Scottish Local Government Pension Scheme the discount rate is an assumption about future investment returns in order to “discount” future benefit payments back to the valuation date at a suitable rate. The Scottish LGPS funds use different discount rates, largely dependent on which actuarial firm is advising them. Some are already using rates that we consider too pessimistic and below the current 3% rate. When we negotiated the SLGPS 2015 scheme, it was based on a discount rate of 3% above CPI. The rate used in future is a matter for the SLGPS Advisory Board to advise Scottish Ministers, so we are not bound by the Treasury view. The Treasury assumptions are used for the cost share calculations. However, they are only used for calculating the employer contribution cap (currently 15.5%). The budget also included the expected announcements on pooling of LGPS investments in England and Wales. These are irritatingly called ‘British Wealth Funds’. They are neither ‘British’ because Scotland is not included, or ‘Wealth Funds’ – they are our members deferred pay and not for George Osborne to play with. Other pension changes in the budget are likely to have a greater impact on our members’ outwith the main public sector schemes. A particularly welcome announcement was that there will be no change to salary sacrifice schemes. These arrangements allow both employees and employers to reduce their National Insurance liability in lieu of pension benefits. It has been an important way for members to be able to afford pension contributions. From 2019 a new digital platform will be launched which will provide details of an individual’s entire pension portfolio. Many in the industry doubt that the dashboard will ever come to light; there are simply too many outdated legacy systems still being operated by insurance companies and pension administrators alike. There is a relatively little used tax and National Insurance free allowance of up to £150 per employee for employer arranged pension advice. This allowance will be increased to £500 per employee from April 2017, which will hopefully enable lower paid employees to access professional advice. From April 2017 anyone under 40 will be able to open a Lifetime ISA, whereby for every £4,000 saved the government will add £1,000 every year until the age of 50. There are a range of conditions attached. He has also increased the annual ISA allowance from just over £15,000 to £20,000. Precious few of our members will be able to save anything near this sum. Many industry commentators reckon this is the Chancellor’s way of implementing a ‘Pensions ISA’ via the back door by creating a voluntary one instead. The risk is that it may encourage younger staff to opt out of auto-enrolment, losing out on employer pension contributions. There is also a risk of scams and excessive charges because these schemes are not covered by pension regulations. The government will also create a ‘new pensions guidance body’, which will replace the Money Advice Service and merge the functions of The Pensions Advisory Service and Pension Wise. They claim this will ensure “consumers can access the help they need to make effective financial decisions”. Highly doubtful. So, while there were few pension headlines in the budget, there may be some hints as to future direction. For the battered public sector, there are just unnecessary additional costs. It is a typical Tory budget. There is plenty of middle class welfare at the expense of workers and the disabled, together with further cuts to public spending. I take a look at the elements that most impact on UNISON members in Scotland. 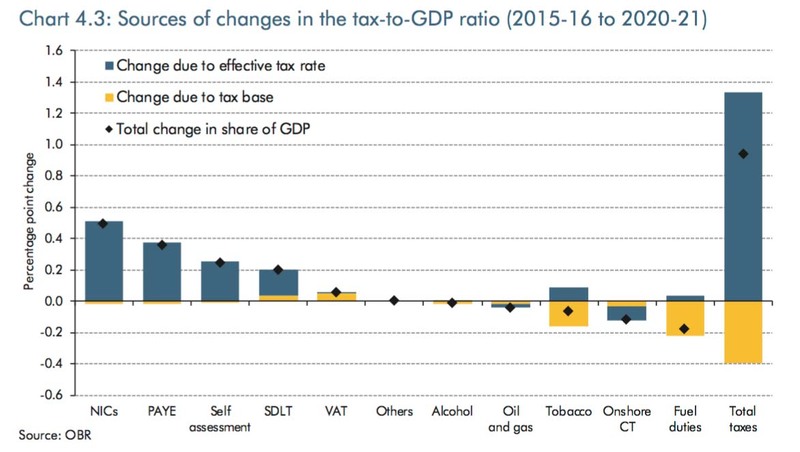 While the sugar tax (more accurately a levy) will make the headlines tomorrow, it is largely a distraction from some pretty bad economic figures. In particular, the growth figures for the economy are revised down and borrowing targets have been missed. The UK economy is £140bn smaller than the Chancellor planned due to spending cuts, low productivity and weak wage growth. George Osborne has clearly not heard of the maxim; ‘when in a hole, stop digging’ – because his solution is to drag the economy down further with more cuts and pushing households into greater debt. So let’s start with public spending. The bad news is £3.5bn of extra cuts from last November’s plans. The slightly less bad news is that they don’t kick in immediately – in fact they now drag past the date of the next UK General Election. This chart shows the changes. 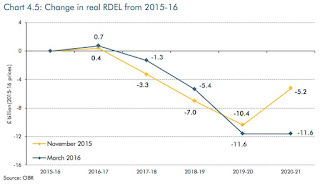 This snip from the OBR risk table shows the revenue and capital cuts more clearly. In particular, note the line on public service pensions. This is not because they are actually costing more, but rather because he has changed the discount rate. This is the assumed investment return used in a present value calculation of assets. Sounds technical, but it comes with a big price tag for public services. For Scotland, this means an immediate Barnett consequential of £650m in additional spending. However, yes you knew there would be a ‘but’, that still means £1bn (4.7%) of cuts by 2019-20. We also still don’t know the Barnett impact of the £3.5bn additional UK cuts; because they haven’t said which English departmental spending they will come from. There could be additional pain for local government if the SLGPS has to change its discount rate in line with the Chancellor’s lead. The OBR also publishes its estimate of the revenue from Scottish taxes in this chart. Scotland’s share of UK income tax is falling, but slightly less than previously forecast. 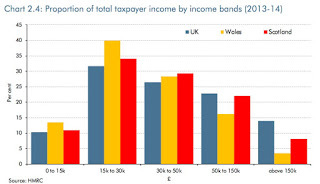 This chart shows the proportion of total taxpayer income by income bands. 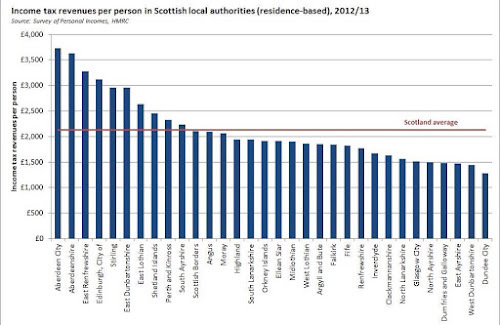 This reinforces the points made in the recent IPPR Scotland paper regarding taxation choices. In essence all good things have to be paid for, and by middle income taxpayers as well as the rich. The next Scottish Government will be left with some other tricky decisions as a consequence of the changes in personal allowances. Increases in personal allowances at the bottom are dressed up as benefiting the lower paid, when in reality they also benefit everyone across the tax bands – they are not a progressive tax cut. The increase in the higher tax threshold is a blatant tax cut for wealthier households, paid for by cutting benefits for the disabled by £1.4bn. Let’s hope the next Scottish Government doesn’t stand ‘shoulder to shoulder’ with the Tories on this one. Another tax decision for the next Scottish Government is Air Passenger Duty. The SNP want to cut it by 50%. The OBR forecast receipts rising from £3.1 billion in 2015-16 to £3.9 billion in 2020-21. Making the cut even more of a burden on the Scottish budget, not to mention the 60,000 extra tons of carbon emissions. Anyone really care about climate change? The cut to Capital Gains Tax is more middle class welfare and taken with the cut in Corporation Tax will encourage income tax avoidance by shifting earnings from income to profits. The new ISA limit at £20,000 is higher than the average wage of a Scottish council worker, which gives a pretty clear indication of who benefits the most from this tax handout. The sugar tax may be a distraction tactic, but it is still a sensible public health policy – even if it is branded as the Irn Bru tax in Scotland. It probably could have been introduced a year earlier than planned and cover a wider range of sugar products. It might bring as much as £52m in Barnett consequentials according to some calculations today. Obviously less if it has the desired effect in changing manufacturers behaviour. Buried away in the OBR report are a few other interesting points for UNISON members. Average earnings growth in the second half of 2015 has been lower than expected in November and the OBR has revised down average earnings growth. 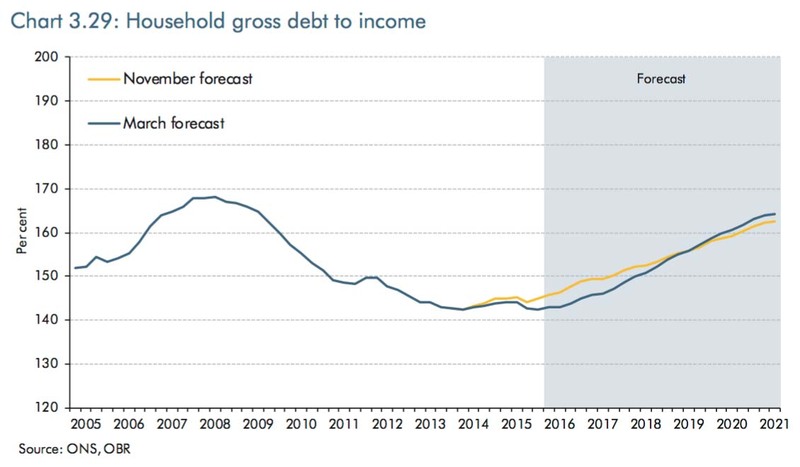 They also expect real household disposable income growth to have peaked at 2.9% in 2015 and fall to average 1.7% a year from 2016 onwards. 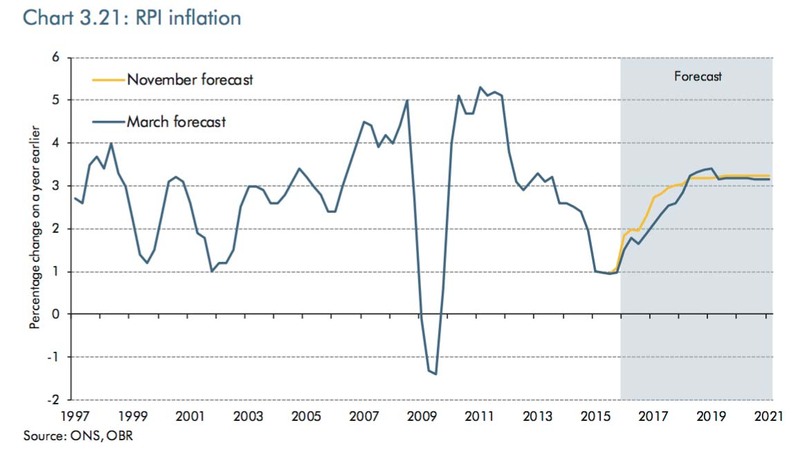 Inflation is expected to increase as this RPI chart shows. The hollow rhetoric of a ‘workers budget’ is exposed in this chart, which shows that it is those paying National Insurance and tax through PAYE who face an increasing share of tax. They can’t take advantage of the tax avoidance mechanisms. 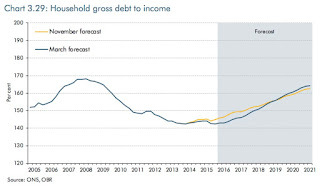 The Chancellor is yet again relying on household debt for economic growth. 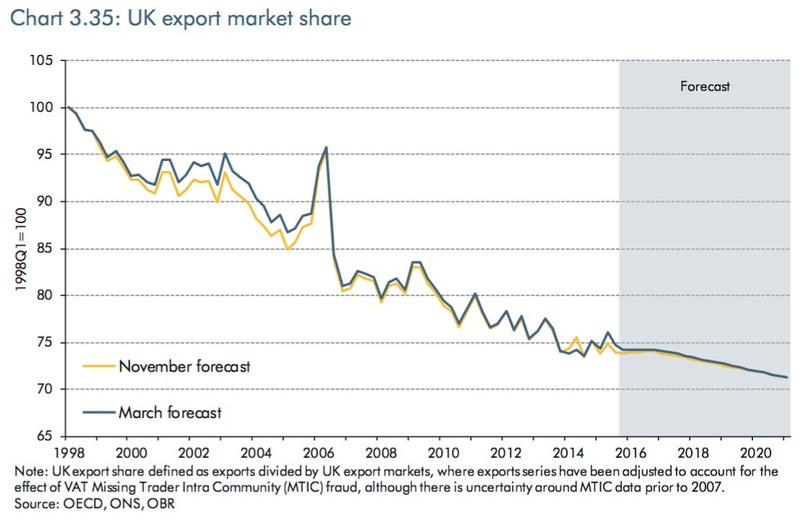 I usually describe this as the scariest chart in the OBR report. Well it just got scarier! No more talk of rebalancing the economy. 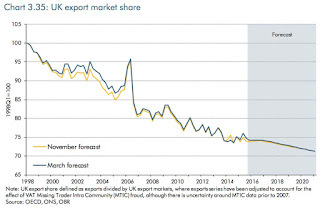 Just as well as exports are forecast to decline. The Chancellor’s decision in 2013 to increase National Insurance contributions will give him a £5.6 billion windfall, with around 50% of the extra burden falling on public sector employers in higher employer NICs. His so called ‘pensions choice’ exercise has also netted him an extra £0.9 billion for the whole of 2015-16, around £0.2 billion higher than assumed. The, sort of, good news on pensions is that there are no changes to tax treatment, although some sensible reforms are necessary. Salary sacrifice schemes that many workers rely on to pay their contributions will also remain. In summary, all that you would expect from a Tory budget. As UNISON General Secretary Dave Prentis said: “Six years of severe cuts to public spending have done little to pay down the deficit, despite the Chancellor’s promises. Yet still he insists on continuing with his failing economic experiment." Jeremy Corbyn also sums it up well! For those who also want to read the all important small print - here is the Red Book, mostly government spin. 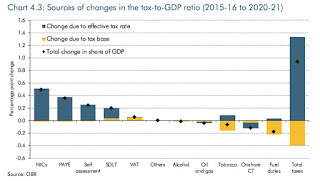 And the more useful OBR report, plus the devolution tax paper. Governments must do more to reduce energy bills by improving the energy efficiency of new and existing buildings. MPs on the Westminster Energy and Climate Change Committee report that the energy efficiency supply chain has been affected by inconsistent and unpredictable policy signals, as various schemes have been chopped and changed. Last year the UK Government announced an end to the Green Deal and reneged on a long-standing commitment to require all new homes to be zero carbon from 2016. The zero carbon homes policy would have saved future homeowners money on their energy bills. They recommend that it should either be reinstated or the Government should set out a similar policy that will ensure that new homes generate no net carbon emissions and are inexpensive to heat and light. In the Agenda pages of The Herald, Sam Gardner from WWF makes the case that energy efficiency should be an infrastructure priority in Scotland. He uses the example of a new investment model in the Netherlands, known as Energiesprong. This scheme is retrofitting entire streets in a matter of days to create net-zero emissions (energy-neutral) homes and regenerating entire neighbourhoods. He says: "There is much that we could learn from the scale and ambition of this approach as the Scottish Government turns its commitment to a national energy efficiency programme into a programme of works. If we are to cut the emissions from our housing sector and tackle fuel poverty all homes must be supported to reach at least an Energy Performance Certificate of C by 2025." He also argues that a Warm Homes Act would bring clean and affordable warmth to households and businesses, by supporting the growth of district heating and renewable heat, while improving the energy efficiency of our buildings. It would reduce heat demand, cut fuel bills and create jobs in a new district heating industry. He says: "By making the improvement of energy efficiency a long-term national infrastructure project, no one in Scotland would have to live in a hard to heat, draughty home by 2025. Public investment in energy efficiency could create up to 9,000 new jobs around every part of Scotland, and ensure 1.25million homes in Scotland will be made warm, affordable to heat, and lower carbon." District heating is unlikely to attract enough investment without a level playing field. In an evidence session to the Westminster Energy and Climate Change Select Committee ADE’s director Dr Tim Rotheray welcomed the £300m of government support, but said the government needs to develop a “regulatory investment framework” to support future growth. He said district heating needs a framework comparable to that which electricity and gas already have so “institutional investors” can compare options. Rob Raine from the University of Sheffield argues that we need to do more to prevent valuable energy being lost to the environment as heat. He points out that it's not just draughty buildings – power stations lose a vast amount of heat through their cooling towers or dumped into waterways, equivalent in the UK to a third of final energy use, while UK industry wastes enough heat to warm more than two million households. Storing this heat can even help us manage renewable energy – at lower cost than batteries. “Labour will deliver a ground-breaking Scottish Warm Homes Act. This will deliver the changes we need to see in planning and building regulations to tackle fuel poverty. The SNP may miss the 2016 target, but Scotland must not give up on ending fuel poverty." Action on energy efficiency is a clear win-win. It helps individuals in fuel poverty, boosts the economy and helps tackle climate change. It's time for action. Cross posted from Utilities Scotland. “There’s nowt wrong with Harold Wilson” is the only thing I remember my late Dad saying about politics. I recall that many other family members didn’t share this sentiment, but it was a view he stuck to doggedly. Today is the centenary of Wilson’s birth, and while like any politician his legacy is mixed, I have generally followed my Dad’s view that he was one of Labour’s best leaders. Wilson was one of the 1945 intake of post-war Labour MPs, representing Ormskirk and later Huyton, which is not far from where we lived in Liverpool. He was a Yorkshireman, from Huddersfield, something my Dad obviously decided not to hold against him! After Gaitskell passed away suddenly, Wilson beat the right-wing candidates George Brown and James Callaghan for the leadership. His legacy as Labour leader is that he won 4 of the 5 General Elections he contested, although this includes a minority government. In October 1964 with a small majority of 4, which increased significantly to 98 after a second General Election in March 1966. As Prime Minister from 1964 to 1970, his main plan was to modernise Britain, aided by the “white heat of the technological revolution”. My dad was an electronics engineer and I suspect this was an important part of Wilson’s appeal. It is often forgotten that his government made huge social reforms. He supported backbench MPs in liberalising laws on censorship, divorce, abortion, homosexuality, and he abolished capital punishment. Crucial steps were taken towards stopping discrimination against women and ethnic minorities, and he also created the Open University. Between 1965 and 1970, 1.3 million new homes were built. A generation of young men and their families should be grateful to Wilson for keeping the UK out of the Vietnam War. Despite repeated American requests, he kept British troops out, while still maintaining good relations. He was generally regarded as being on the left of the party, although that is a contested view. He was certainly a pragmatic working class socialist who refused to join the Oxford Labour Club saying, “What I felt I could not stomach was all those Marxist public school products rambling on about the exploited workers and the need for a socialist revolution”. Wilson resigned with Bevan (who was a close political friend) and Freeman from the Atlee government over increasing defence spending at the expense of the NHS and in particular charging. They joined the Keep Left Club and made it a strong force in the party. Some argue this was just a devious calculation, but I share Philip Ziegler’s view that, “He may not have been impulsive or idealistic but his resignation was an act of political courage, a gamble which fits ill with the image of cautious and devious time-server which has won such wide acceptance”. Topically, he also held a referendum on membership of what was then the European Economic Community in 1975 and allowed his cabinet to support both the yes and no campaigns. This led to a bitter split in the party, something the current Prime Minister should be painfully aware of! Sadly, dementia forced him into retirement in 1976. I’ll ignore the daft conspiracy theories. We should be wary of ‘what ifs’ in history, but I doubt if he would have made Callaghan’s mistakes in 1978/79. Then Thatcherism and all the misery that went with it might have been avoided. Pragmatic politics would have won through. I see Labour MP Barry Sheerman is calling for him to be recognised as one of the 20th century's greatest prime ministers with a statue in the House of Commons. The least we can do for a truly reforming Prime Minister. We have plenty of land in Scotland, and plenty of sea, and plenty of skilled people, scientists and innovators. There’s no reason why we shouldn’t have plenty of good food for everyone. That is the key message from the launch of the Scottish Food Coalition’s report: ‘Plenty: Food, Farming and Health in a New Scotland’ at UNISON House today. The coalition brings together a wide range of organisations that have an interest in developing a more progressive food policy in Scotland. UNISON Scotland represents a wide range of workers in the food industry. From those who inspect food production at source and regulate the safety of food operations – to those who cook and serve food, particularly in our schools and hospitals. We also have a wider concern to ensure that food policy contributes to a more equal society that protects our environment. Our Food for Good Charter represents the approach we would like to see food policy take in future. Our members working with food face significant pressures. From light touch regulation of meat inspection at Food Standards Scotland, to cuts in environmental health departments, food safety is being compromised. Catering staff are also trying to produce nutritious meals on ever smaller budgets. In our last member survey, most workers described the negative impact of spending cuts on the quality and quantity of the food they provided. The food system should value people. By taking action to prevent food poverty through the benefit system, to ensuring all employers pay at least the Scottish Living Wage. Equally important is creating democratic structures to facilitate public engagement that challenges the power of corporations. We need sustainable food production that ends the negative environment impacts on the food system and our climate. Championing CAP reform and properly enforcing food and environmental legislation by taking a whole system approach to the impact of food on climate change. The Scottish diet wins few accolades and we can do much more to improve our food culture. Food purchased with public money should be nutritionally balanced and sustainably sourced - joining up school catering with the curriculum and the community. In the private sector, caterers should be required to report on nutritional composition and pay a levy on the difference between their sales and national nutritional targets. We need to cut the length of food supply chains, creating a better connection to our food. We should strengthen planning to support diversity in town centres, including farmers markets and safeguard land for growing food. Encouraging community land ownership and community-connected agriculture, including allotments. To drive these changes forward, the report proposes primary legislation that enshrines the Right to Food in legislation. It should include the creation of a statutory Food Commission that provides oversight and scrutiny of our food system – reporting directly to parliament. For too long food policy has been addressed in silos, with the big commercial producers having the dominant say. This report is a first attempt at building a broader consensus that joins up the strands of policy into a coherent whole. The First Minister has made the welcome announcement that the Council Tax freeze will end next year and has published the outline of some reforms to local taxation. The much needed detail is due in further consultation papers that will be published after the election. The headline is some stretching of the higher bands. Bands A-D are unchanged and the others will increase as follows: band E - £105; band F - £207; band G - £335; band H - £517. This does make the Council Tax more progressive, but it is hardly 'radical'. Stretching the bands was proposed in 2007 and rejected at that time by the SNP. Eight years later, at a cost of £3.15bn to local services, we have come full circle. Importantly, there is no indication that there will be a revaluation of properties, which means properties are allocated to bands based on 1991 property prices. Like a proper reform of the Council Tax, this was presumably put in the 'too difficult' file. Labour made the same mistake in response to the Burt Report in 2007. There are some welcome changes to council tax benefit to provide additional support to families by increasing the child allowance within the council tax reduction scheme by 25%. Extending the council tax reduction scheme to exempt 54,000 households on low net incomes, but who live in higher property bands, appears sensible as well. No doubt those who understand the interaction with the benefits system will have views on these changes. Ending second home discounts and the development tax is also good news. It is very welcome that the regressive council tax freeze will come to an end in 2017. However, councils are to be told that any increase must not exceed 3%. We also have a nice infographic telling us that that the new system means £100m for schools. Does this mean further ring fencing or ministerial direction? This goes to the root of the problematic relationship between local and central government in Scotland. It is for democratically elected local councils to decide what the council tax should be and what it should be spent on. Not big brother government in Edinburgh. There is an outline proposal that councils could have a share of income tax revenues assigned to them. I suspect this is the First Minister's way of gently letting her supporters down over dumping the unworkable and unfair local income tax plan. However, I am frankly struggling to see how assigning revenues makes local taxation more progressive as the government claims. The problem with assigned revenues is that they are largely cosmetic. UNISON opposed the Smith Commission plan to assign 10% of VAT revenues to the Scottish Government for the same reason. It is not clear to me from today's announcement, how these assigned revenues will be adjusted to reflect economic growth. 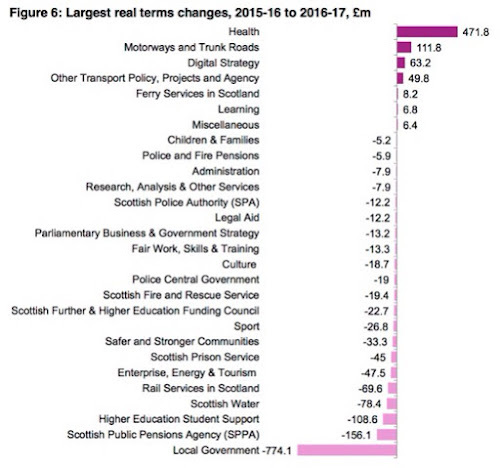 In any case, as the Scottish Government rightly argued in the fiscal framework negotiations in relation to their powers, councils have even fewer levers to influence economic growth. In addition, is the Scottish Government proposing to use income tax generated by payroll where taxpayers work, or where income tax payers reside. An important issue in a city like Glasgow with leafy suburbs. And we have to ask how an equalisation scheme would work. This chart highlights the problem. The short answer appears to be that they haven't worked all this out, but needed to say something before the election. After eight years of inaction, we might have expected a bit more. Of course all of this doesn't happen until 2017. The additional revenues won't save a local service or a job in the coming year. John Swinney made great play of council reserves over the weekend. His claims are exaggerated because the way council reserves are accounted for doesn't mean the cash is sitting in the bank ready to be spent. However, if I can pinch his own hyperbole, its not 'utterly exaggerated' - it is something we have highlighted before. Mind you, council leaders are entitled to a wry smile given John Swinney's own under spends with the Scottish Government's budget! The promise of additional revenues next year may well encourage some councils to use reserves to plug more of the gaps in their budget. Others may have an eye to George Osborne's recent statements about public expenditure, as he digs a bigger hole for the UK economy. The problem remains that the Scottish Government has consistently shunted austerity onto councils. I have covered this before, but here is another chart that starkly makes the point. The best we can say about today's announcement is that we are to be spared another pre-election council tax freeze bidding war, as in 2011. For that we should be grateful. However, after eight years of stop gap measures, we might have hoped for a proper reform of local taxation. Sadly, this isn't it. ‘Is there a Scottish Road to Socialism?’ This is the question posed in the third edition of this SLR Press book. The format is the same – a range of contributors from across the left wing spectrum in Scotland attempt to answer this question. The last edition was in 2013, pre-dating the independence referendum and the General Election. These have been turbulent years in Scottish and UK politics, so a new edition is certainly justified. There are 18 contributors, excluding the Editor, Gregor Gall, who has his own unique analysis. They can be grouped into some broad camps with similar approaches. We have the far left camp, including those grouped into the latest attempt at partial left unity, RISE, including Cat Boyd, Neil Davidson and Colin Fox. Together, or not, with Tommy Sheridan of Solidarity and Philip Stott of Socialist Party Scotland. Their analysis predictably sees a space caused by Labour’s demise for the far left in Scotland that the Greens cant fill because they have little appeal in working class communities. The fact that their vote rarely secured more than 0.4% doesn’t appear to have dented their optimism. Independence remains the priority, particularly for Tommy, and almost everything else is secondary. Maggie Chetty and John Foster give different communist perspectives, recognising that they were on different sides of Indyref. Maggie emphasises the opportunities of independence, while John promotes progressive federalism with a strong section on class consciousness and national identity. From a Labour perspective Neil Findlay/Tommy Kane, Lesley Brennan and Katy Clark point to the election of Jeremy Corbyn as the transformational change while exposing the contradictions in SNP policy. It’s a point acknowledged by other contributors, even if they doubt its impact in Scotland. Pauline Bryan topically focuses on the EU. Lyn Henderson places more emphasis on extra parliamentary activity, including the People’s Assembly, to give her some optimism for the future. Jim Cuthbert sets out his criticisms of the Smith agreement and the difficulty of achieving fundamental social change in the current constitutional settlement. Margaret Cuthbert looks at a range of Scottish Government initiatives, and while making the case for greater economic levers, finds the Scottish Government’s use of current powers unexplainably weak. Peter McColl argues that the Scottish Green’s have moved from being the environmental conscience of the other parties, to being a radical participatory movement around ideas like a citizens Income, land reform and radical democracy. The dead hand of middle class environmentalism has apparently been lifted to reveal the true radicalism of Green politics. Chris Stephen’s left SNP perspective, gives us a reasonable analysis of where Labour went wrong and how independence could come about, but notably doesn’t make the case that the SNP is the route to a socialist Scotland. Austerity may help fuel the demand for a second referendum, but that still doesn’t tell us how the SNP can move from being a social democratic (or social liberal as Gregor Gall argues) force, to one that embraces fundamental social change. Leanne Wood from Plaid Cymru gives us a similar structural analysis for Wales, but without an ideological road map. My own chapter continues where I left off in the second edition. As someone who didn’t take a position in the referendum, I set out my views of both campaigns, but Labour’s in particular. The failure to grasp the strategy suggested by the trade unions was hugely damaging, even if Labour’s problems pre-dated the referendum. While I have been brutally honest (probably too brutal for some comrades!) about Labour’s failings, I focus on where next for Scottish Labour. The changes in Scottish Labour may have happened under the radar, given the impact of Corbynmania, but it is none the less significant. I make the case for big and bold policies and point to early signs of progress. Since the book was written we have had the boldest of policy shifts with the 1p on income tax policy. This positions Labour very firmly as the anti-austerity party and the SNP in the centre ground where most of its leadership is comfortable. I am always amused to see how closely the SNP follows the New Labour text book. It may be electorally successful, it may even some day deliver independence – but socialist it isn’t. I conclude that Scottish Labour, for all its failings, remains the only realistic prospect for socialism in Scotland. The nature of a book like this, with eighteen contributors, doesn't leave the reader with many consistent themes. It may also drive you to despair, given how much energy is spent finding difference, when the actual policy gap between the contributors is not that great. However, it has the advantage of being a bite sized read and does give a fair picture of where the left in Scotland is at today. You can purchase a copy of the book at the very reasonable price of £5.99 at Scottish Left Review Press.